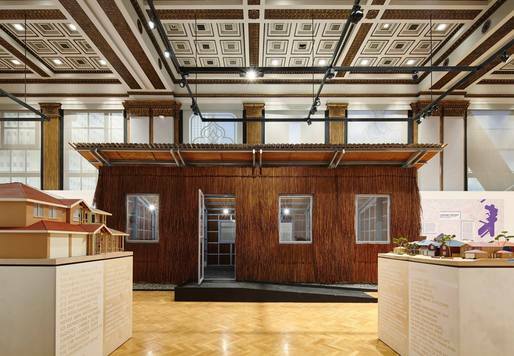 29/10/2015 | Comments: 0 | Posted by: jessicaletaw | In: U.S.
Chicago is hosting North America’s inaugural Architecture Biennial this fall (3 October – 3 January). Titled “The State of the Art of Architecture,” architectural firms and practices from all six continents have been invited to display their work. Spanning all sizes and kinds of projects, the Biennial is showcasing solutions to design problems from spiderwebs to social housing. U.S. buildings use around 40% of all the country’s energy consumption. It is a disconcerting truth that even if every building starting tomorrow were to be net-zero energy and net-zero water, we’d still be on a crash course draining more naturally-available resources than our one planet can permanently sustain. In this environment, architectural designers have a special responsibility to educate themselves about innovative sustainable design techniques, from those that have worked for thousands of years to those that, as the Biennial’s title hopefully suggests, are state of the art. So what does the Biennial have to say about sustainability? Below are five different approaches at five different scales: material, building, resource, city, and the globe. This installation is a refreshing taste of nature in the hyperornamented Chicago Cultural Center. It is comprised solely of trees that have been sawn, planed, and stacked. 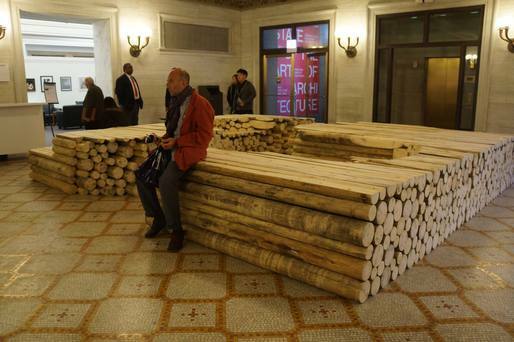 According to Kéré, the installation is “built simply, with locally sourced wood” that will be routed to local building projects once the Biennial is over. This locally-sourced, zero-waste project is a comfortable configuration for people of all ages and abilities to perch, rest, chat, and clamber. The takeaway: With careful planning, it is possible to approach projects that address both responsible material sourcing and end-of-life disposition. It is difficult, but it is not impossible, and this is a quietly graceful example of a sustainable approach to material thinking. Modular prefabricated housing is one of the holy grails of architecture. It’s not that this product doesn’t exist; it’s just that achieving it is either incredibly difficult or incredibly expensive. That holy grail is exactly what VTN are crusading for with S House. Designed as a prototype for the Mekong Delta in Vietnam, they can be built in three hours by unskilled labor; residents are encouraged to participate in the construction of their own homes, a la Habitat For Humanity. What makes this prototype even more special is that is sensitive to its environment: a kit of parts that works with, not against, its local ecology. The home is an efficient space that’s both weather-resistant and sustainably sourced, as in the rust-resistant galvanized structural steel and distinctive palm tree thatching that makes up the building’s exterior walls. According to VTN, they are in the process of scaling this process up; they have already moved to mass production in Vietnam and are working on developing the process so that it can be applied overseas. In designing environmentally responsible housing that’s almost universally accessible, VTN is changing the world for the better. The takeaway: It is possible to design low-cost, modular, prefabricated housing that requires minimal ongoing maintenance using locally-sourced materials. 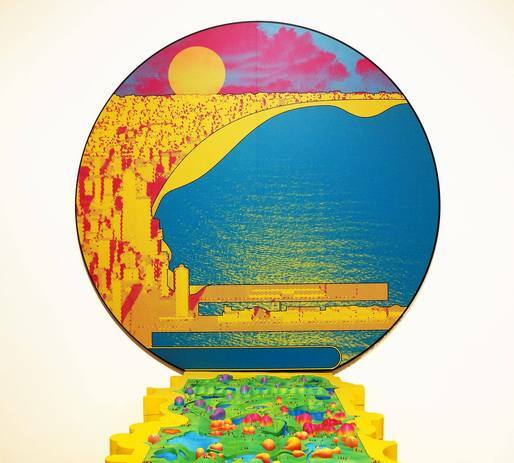 Filter Island seeks to address Chicago’s overtaxed water management system while envisioning new civic possibilities. While targeted specifically at Chicago, this proposal relates to any city struggling to ease the burden on its aging and insufficient water infrastructure. The proposal It suggests that Chicago turn part of the city into what would functionally be a living machine: a water treatment system that uses a series of tanks and phytoremediation (plantings) to process water on site which translates to net-zero water usage. Buildings like the San Francisco Public Utilities Commission are already doing this; from a reliance on passive/renewable energy sourcing to their living machine, SFPUC uses only the energy and water available to its physical footprint. Filter Island is a dramatic proposal, and while its urban planning elements (relocating multiple urban neighborhoods? rerouting the Chicago River?) are not practical, it’s an example of the kind of unconventional thinking that will be needed to solve the resource scarcity problems of the 21st century. The takeaway: Filter Island is an imaginative example of city-wide net-zero water managementon which urban areas will increasingly need to rely as the climate continues to change and the global population grows. When talking about architecture projects, new buildings are usually the first thing to come to mind, when in reality the overwhelming majority contend with existing building stock. This video depicts one ultra-site-specific response to a common urban preservation issue; the specificity of this team’s solution to this project is simultaneously a window on the universality of their approach. In the early 2000s, design team Anne Lacaton, Phillippe Vassal & Frédéric Druot conducted extensive qualitative and quantitative research around Modern social housing in France. 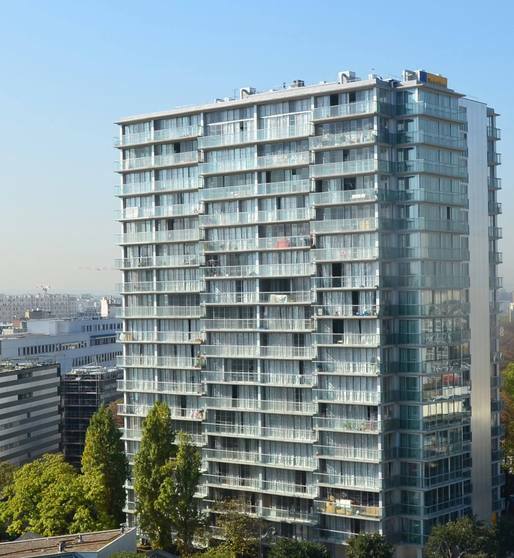 Using one such building in Bordeaux as a sort of living laboratory, they demonstrated that it was possible to substantially improve energy performance and the quality of life of its occupants while increase housing stock inventory at a fraction of the financial and environmental costs of demolition and replacement. Their strategy was simple. Rather than waste the embodied energy of the existing building by demolition and new construction, the team proposed a series of modest façade enhancements, energy performance upgrades, and a 4’ footprint bumpout. All told, the building doubled its energy efficiency while accommodating 66% more square footage, and providing previously nonexistent private outdoor space in the form of patios and balconies. The takeaway: sometimes the easy solution is not the same as the right one. Investing more time in a solution up front can result in significant cost, construction, and energy savings. Despite its brutish appearance, this is in fact a space-age project. The team brought a multi-axis robot into the Chicago Cultural Center, programmed it with a repeating four-quadrant pattern, and loaded it up with an extremely long continuous length of string. They then began laying the string in layers, building plywood formwork around it, and pouring small rocks in. Once the installation had reached about two panels high, they carefully removed the formwork, leaving an 8′ x 8′ x 15′ rock column that is solid even without adhesives or mortar. This project is deeply exciting with respect to sustainability in two dimensions: in embodied energy, and in end-of-life consideration. Very little energy was expended to create this structure; and yet it is building-scale using only two materials and an infinitely repeatable design. And yet, for all its strength, this column will be incredibly easy to undo: just tug the structural underpinning – a single, household, ordinary, continuous length of string – and this load-bearing (tested to 6,000 lbs) column will unravel like a sweater. Practical applications for this, as with the modish 3D printer, feel remote at the moment; but its eventual implications forsustainability, resilience, and humanitarian building are potentially enormous. 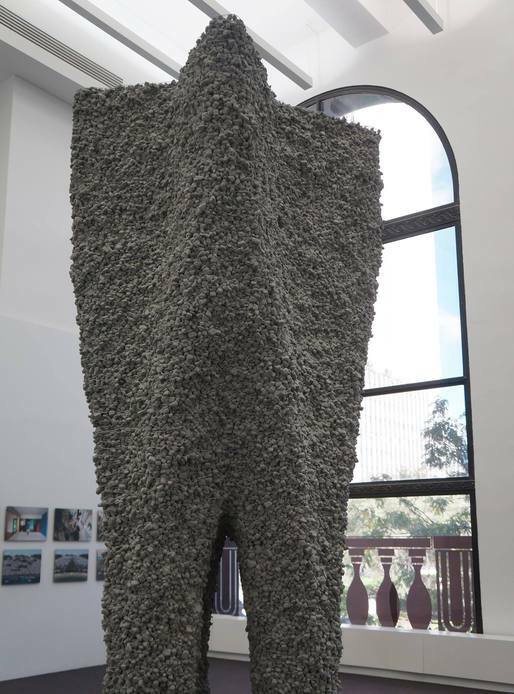 The takeaway: the first architectural construction built by robotic machines using only rocks and thread, Rock Print presents a unique combination of state-of-the-art knowledge from architecture, digital fabrication, and material science. © jaslWerk LLC 2017. This work is licensed under a Creative Commons Attribution-NonCommercial 4.0 License.